If you want to buy some firecrackers for New Year's Eve, look no further than your local fruit shop. 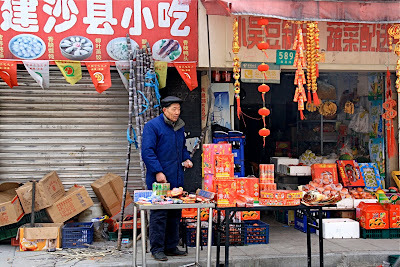 You're very likely to find that a makeshift stall selling fireworks has sprung up beside the bananas and baskets of tangerines, just like this one on Nanchang Lu. Now if you only have 5 yuan, that will get you about 50 short sparklers. Enough to keep 2 children occupied for say, 5 minutes. And requiring about 150 matches. If you have 20 yuan you can buy 10 Super Sparklers, they shoot flames from the tip. They're about 80cm long, alarming easy to light and much more entertaining, although slightly more hazardous. Should you have 100 yuan, you can have a big fat box of really noisy, totally unregulated, full-on fireworks. Enough to keep one husband and about six other helpful blokes very happy.